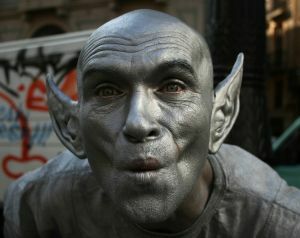 The Lingua File from TLF Translation: Elvish: What You Tolkien About? In honour of Hobbit Day (it's a real day, look it up! ), we're discussing fictional constructed languages, or conlangs to those in the know. In particular, we're looking at J. R. R. Tolkien's creation of Elvish, its many derivatives, and other languages. First of all, how do you go about creating a fictional language? You can't just speak gibberish. There are certain qualities of speech that humans recognise as language and certain traits that readers, viewers or listeners can attribute to other languages. Someone who knew the value a fictional language could add to a fictional universe was none other than Tolkien. In fact, Tolkien stated that he created the languages first and the stories eventually grew from there. His discovery of Finnish (people were already aware of Finnish, it was more of a personal discovery) helped reignite his passion for conlangs. 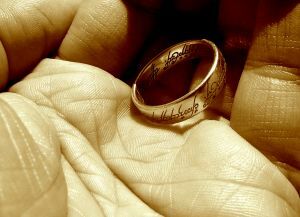 The "One Ring" is actually inscribed with "Black Speech" in Elvish script. Tolkien created several languages, not just for the Elves, but also for several other races featured in Middle-earth. He was actually a philologist by trade. Philology combines the disciplines of literary studies, history and linguistics. He probably doesn't speak any forms of Elvish. Tolkien was clearly very talented and knew how to make a good conlang. If his stories came from the languages then no further evidence is really required. Making your own language is not as easy as spouting nonsense, since you're required to create the lexicon, grammar, phonology and syntax just for it to work. Not something that we'll be doing on a Saturday! Regarding yesterday's post (available here, or below if you're not lazy and prefer to read on) on ghoti being pronounced like fish: we thought we'd mention that the Klingon for fish is ghotI, being one of the saddest, yet brilliant linguistic in-jokes ever.